Just as the pyramids in Egypt, the sphinx attracts a large interest because an univocal explanation for the function of this colossal sculpture still cannot be given. Mystici say that the sphinx contains large secrets. One of those is that the Sphinx would refer to a date 10,000 years ago, a date that also is linked to the fall of Atlantis. In his book 'The Orion Mystery' (1994), Robert Bauval claims that the three largest pyramids on the Gizeh plateau were built according to the pattern of the three stars in the belt of the constellation of Orion and refers to the date 10,500 BC. In ‘Serpent in the Sky' (1993), John Anthony West states that the sphinx is a lot older than the three pyramids, because there are erosion marks on the sphinx due to heavy rainfall. On the bases of this, he also claims that the sphinx would have been build around 10,000 BC. Followers of Edgar Cayce (1877-1945), also known as `The sleeping Prophet`, are convinced that under the sphinx the "Hall of records", a sort of book storage place of Atlantis is located that contains important information concerning humanity. Egyptologists are not very impressed with these ideas and have come up with good arguments to dismiss them. 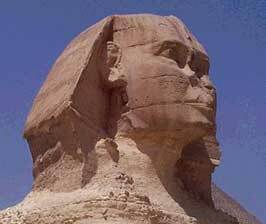 The professional archeological World has generally accepted as a fact that the sphinx was build in about 2500 BC and have to be linked to royalty and power. About 10 years ago, I started to wonder why most of the pyramids in Egypt were build exactly on, or just around the thirtieth degree of latitude. It was my opinion that it had to be linked to Sirius, the most important star for the Egyptians. At the same time, I was wondering why Sirius plays such a large part in the constellation Canis Maior, while Procyon gets little attention in the constellation Canis Minor. Sirius is the brightest star in the sky but Procyon ranks eight at the complete starry sky. 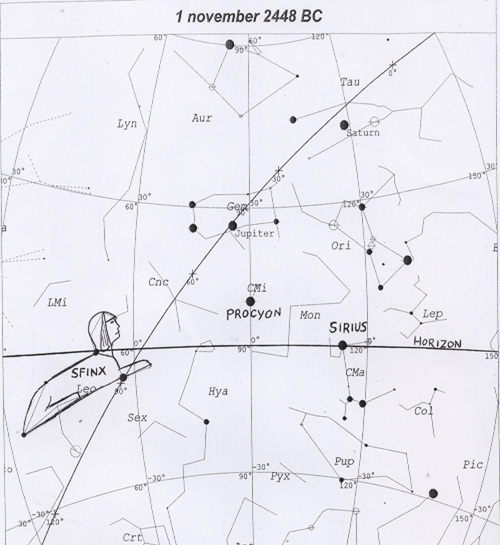 The name Procyon in Greek means `for the dog`, because this star rose shortly after Sirius in the old Alexandria. If these two stars would rise simultaneously at the thirtieth degree of latitude, Procyon would then be used to accurately determine the rising of Sirius. This way, all inefficiencies at the horizon could be eliminated. In November 2000, in the newspaper De Volkskrant, Kate Spence of the faculty of Oriental Studies of the University of Cambridge published an article describing how the Egyptians could determine the North accurately using the start Mizar and Kochadb in respectively the constellations Canis Maior and Canis Minor. She had calculated that in 2467 BC, these two stars would point exactly north at the moment that they were standing vertically at the horizon. On the basis of the deviation which the pyramids have in comparison to the North, she could subsequently determine in which year the start of the building of the pyramids took place. After having read the article of Kate Spence, it seemed interesting to me to find out whether the date she had determined (2467BC), could also apply to the simultaneously rising of the stars Procyon and Sirius. After having contacted her, I have used the computer program that she had recommended to me for my calculations. Then I have determined the date at which Sirius and Procyon rose simultaneously at that degree of latitude. This was in 1799 AD. The simultaneous rising of Procyon and Sirius therefore had nothing to do with the building period of the pyramids. After this, I have researched if at the calculated date, as found by Kate Spence, a different star would rise simultaneously with Sirius. To my big surprise, I saw that at that date Sirius rises at the moment that Procyon points East. This observation could have been used by the Egyptians to line up their pyramids exactly East. They only focus at Procyon and register that point at the moment that Sirius appeared at the horizon. Because small differences in rising would be visible on a astronomical map, I have determined the moment at which Sirius rises and Procyon points precisely East. This was at November 1, 2448 BC. This date corresponds with the calculations of Robert Baucal which are written in his book Het Orion Mystery, the building of the great pyramid of the Gizeh plateau, namely at 2450 BC, using the shank that was aimed at the star Sirius during that year. I found it more remarkable that only the head of the Zodiac sign Lion comes above the horizon at the moment that Sirius arises, according to the astronomical map of 2448 BC. I immediately thought of the Sphinx. When you look at the Sphinx, you can see that the only animal part that is replaced by a part of the Pharaoh is its head. The pharaoh has apparently been searching for a way to record this astronomical moment for all eternity. This moment has been recorded by replacing the head of the lion, that arises above the horizon at that moment, by the head of the pharaoh. As we look at the Zodiac sign, this looks a lot like the sphinx. Especially the horizontal front paws are characteristic. This way, the sphinx is a monument that indirectly refers to the building period of the pyramid (see astronomical map of 1 November 2448 BC). Note: this calculation has been done with the program Skymap Pro 7. This is the same program with which Kate Spence has done her calculations. This program has meanwhile been developed and improved and Skymap Pro 11 is in circulation. When using the later program, August 2, 2448BC is the result instead of November 1, 2448 BC. If I would have been alive in 2500BC, and I wanted to record my presence for my offspring, I could have done this by building a large pyramid. This way I could have left my visiting card, and by this proving that I was a very powerful person but it still wouldn`t give any information about the time that I was living in. By recording an astronomical moment in the shape of a huge statue, this date would have been recorded for all eternity. If we would accept my hypotheses, we could conclude that the building of the pyramid and the building of the sphinx would have been done simultaneously. One could say that this fact is not remarkable because the professional archeological world already assumes that he building date of the sphinx would be about the same of the building period of the pyramids on the Gizeh plateau. Still, this discovery gives new insights. At the beginning of the sphinx, a temple has been excavated in which two altars were found. One altar is aligned towards the East, the other is aligned West. At this moment, it is unknown which gods were worshipped in these temples. 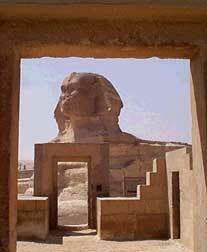 Because the sun rises in the East, and sets in the West, and the sphinx is aligned to the East, it is commonly accepted that they are sun temples. However, according to my theory, Sirius and Procyon can be put in connection with the sphinx. This makes the complete picture more clear. Sirius is linked to the goddess Isis and Procyon to her daughter Neftis. Both goddesses have an important role at the funeral rituals of the pharaoh. Isis has brought her brother Osiris back to live. Horus was born and therefore can be considered to be the goddess that had to bring the pharaoh back to live. Neftis is being seen as the guide of the deceased pharaoh. The eastern altar is, according to my hypotheses dedicated to Isis and the western altar to Neftis. This way, each day at the rise of Sirius, the pharaoh is reborn and at the downfall of Procyon, the pharaoh is being guided into the land of the dead by Neftis. These rituals could be performed of course, without the presence of the sphinx. I would like to refer to the core of my hypotheses: the pharaoh has only been looking for one way to mark the time for eternity. My hypotheses could explain why the head of the sphinx is small, in comparison to the lions` body. Some scientists think that this can be explained by accepting a theory that says that the sphinx initially was build as a lion and that, later on, the lions` head was carved into the head of a pharaoh. The pharaoh was linked to Horus, the son of Isis in the old Egypt. If we look at the astronomical map of 2448BC, at the exact moment that Sirius rises, the pharaoh is being brought back to live by Isis, and will be reborn as her son, Horus. The lions head, which is above the horizon at that moment, has had this pharaoh change already. Because eventually the entire lions body had to change into the body of the pharaoh, they choose for a smaller head. We have to look at the sphinx as a pharaoh within the body of a lion and not as a lion with a pharaoh`s head. Another proof for my theory is the presence of the `big star`. The identity of this star is unknown so far. Its location is indicated by the pyramid spell number 1038 with `in the middle of the East`. This has to be Procyon. As far as size goes, this star comes at the eighth place in the complete starry sky and can justly be called the `big star`. Because my theory can prove the presence of the sphinx, I have given it to De A.Egberts of the Technical University of Leiden, dr Kate Spence of the University of Cambridge and Prof. Dr. Harco Willems of the University of Leuven. These Egyptologists still reject my theory based on the fact that there is no evidence that Egyptians knew the Zodiac sign Lion in 2500BC. Thank You for your comments. The problems I see are that using the rising of Sirius to determine east using another star is still reliant on horizon conditions. It is not proven that the Egyptians were able to visualise the stars in the same way as we do and for that reason probably did not use the same constellations. Our constellations are thought to have originated in the Near East and belong to a different astronomical tradition than that of the Egyptians. It is very unlikely that they had a constellation the same as our Leo and also represented as a lion. Mr. Egberts makes a link between the function of the sphinx and the relation lion/royalty. The Egyptians in the new empire see the lion as a manifestation of the god of the sun. Not only for the new empire, but also for the old empire may we assume that there was a link between the sphinx and the sun, because the Egyptian king was considered to be a son of the sun god. Therefore, an association with our zodiac sign Leo is unlikely. The largest section of the Egyptian sources that refer to the zodiac signs, can be found in the book Ancien Egyptian Astronomical Texts, by O. Neugebauer / R. Parker. This work will show you clearly when the Babylonic-Greek zodiac signs, which we still use, were introduced. That the sphinx still refers to this, seems to me as a strong hypotheses. From a pure scientific point of view, these remarks are fair. There is no evidence that is being considered to be false. I still wonder what would happen with our history as we know it, if we had to defend all the facts in a court. We haven`t have any witnesses from that time and when one would refer to history writers, the opposing lawyer would simply state that these facts could simply have been altered to fit any political or personal motives. I therefore wonder with what certainty the current Egyptologists have translated the incidentally found texts from the old empire. Who can guarantee that when translating the word lion from the hieroglyphs they meant the animal and not the zodiac sign? These translations took mostly place in a period that a link between archeology and astronomic was not apparent. The theory that the lion was seen as a symbol for power, and that therefore the head was replaced by the head of the pharaoh seems very unlikely to me. Which Egyptian would have doubted the power of the pharaoh or by seeing a pyramid. Even the sphinx is, despite of its, compared to the pyramid a small construction. This does not mean that the relationship lion and royalty cannot go together. If the pharaoh wants to use the appearance of the lion for his resurrection, then we may assume that this animal had a royal status in the eyes of the pharaoh. We know that lions were present in the old Egypt because images of pharaohs on a lion hunt have been found. The difference between my theory and the theory of the professional archaeologists stays limited to the fact whether the Egyptians in 2500bC were familiar with the zodiac sign lion. A second argument for me is the fact that the old Egyptians have proven to be excellent astronomers by building the pyramids. Everyone who is interested in astronomic knows that the naming of star communication is nearly impossible without the use of the zodiac signs. We can compare this with a map that has no rivers, lakes, mountains, country borders etc on it, and on which we still have to identify cities. That is why I am convinced that the Egyptians have recorded the visible signs in zodiac signs. At this moment there is little information present concerning the star groups and their names. First of all I will briefly explain what a heliacal rising is. Some stars rise and descend just like the sun. Other stars are present in the nightly sky because they are located in the north hemisphere, like the Polar star. If a star rises after the sun does, it will not be visible because of the bright light of the sun. The rising of Sirius is therefore not visible approximately 70 days a year. After the summer solstice at June 21, the sun rises later and later, and Sirius rises earlier. There will be a moment at which the rising of Sirius will be just before the rising of the sun and therefore can be observed. This moment is called a heliacal rising. Now that the sphinx can be put into connection with the rebirth of the pharaoh, we can interpreter the heliacal rising of Sirius differently. In the professional archeological world, the heliacal rising of Sirius has been put into connection with the yearly flooding of the Nile, when fertile mud is being spread over the agricultural grounds in the Nile delta. These floodings never occurred at the same date. Now that my theory about the sphinx can put Sirius into connection with the rebirth of the pharaoh, we can give the heliacal rising a different meaning. If we believe that the sun is the most important energy source on earth for all earthly life, then life will wake up when the sun rises. The gods and the pharaoh also had a place in the kingdom of heaven according to the Egyptians. They were not dependant of the sun but had taken their place between the stars. If the pharaoh is reborn each day at the rising of Sirius, there would be one day each year when the Egyptians and their pharaoh would wake up at the same time, the day that Sirius and the sun would rise almost simultaneously. In this relationship, the period of 70 days for the embalming and mummification of the pharaoh was used. These 70 days corresponds with the period that Sirius is not visible because its rising is later than that of the sun. Just like our Christmas celebrations, the Egyptians had one day each year when the distance between god and man is the smallest. My theory about the sphinx will be disappointing for many people. There is after all no date which can be put into connection with the downfall of Atlantis. No references to secret chambers beneath the sphinx where important documents would be stored. My hypotheses can at best be compared with our own ancestors who recorded the building dates of their houses and farms with wall anchors. The pyramid is in this comparison the house of the pharaoh and the sphinx has replaced the wall anchors. Important is however, the persistent way in which the professional archaeological world rejects my theory while it leaves less questions unanswered than the present theories. We can simply state that if we had the same knowledge about the Egyptians, with the exception of the presence of the pyramids, and we would ask the professional archeological world questions if the Egyptians in that time were able to build such perfect pyramids, they would laugh and answer that this would have been impossible. Now that they have been build, we cannot but accept this fact that they were quite clearly capable of doing this. Then, how small is the acceptation with their astronomical knowledge, they would have been aware of the zodiac sign Lion.